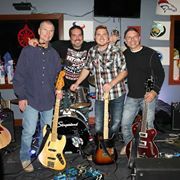 Each of us has been playing live and or toured as recording artists from as little as 2 years to 45 years.....Our music covers a vast array of Modern Country including Keith Urban, Frankie Ballard, Jason Aldean and Thomas Rhett to the Modern Rock music of Collective Soul, John Mayer, Georgia Satellites and 38 Special. We get you up...tapping your foot and dancing the night away. Kokomo is our home base and we are so proud to be part of this community and participating in events that benefit the people of Howard County. Our members: Drums & Vocals, Dr. Rob Lesko of 20/20 Vision Inc, Kokomo; Lead Guitar & Vocals, Lynn Graeber of Graeber Construction; Michael Wright on lead vocals and Russell Favricka on Bass Guitar.